More than 80 high school treble singer make up this talented treble choir. Coro Pacifica singers must be able to hold their own part in 3-part treble harmony. 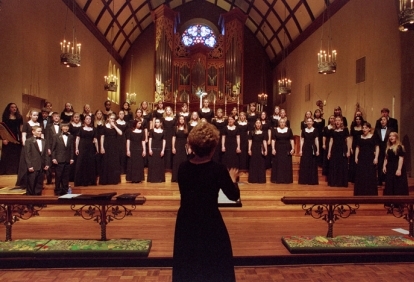 Good music reading, vocal technique, and prior choral experience are required for entrance into this group. Coro Pacifica singers are also Pacific Choir members. High school-aged tenors, baritones and basses make up this choir. Tsunami singers have great fun while singing beautiful choral music. The singers in Tsunami are also members of Pacific Choir. A 2009 Chorus America study shows that choral experience for young people improves academic performance, develops stronger social skills, leads to better emotional expression and management, and increases participation. We have seen this first hand with our students at PYC@Whitman! In fall of 2016 we initiated a pilot project, PYC@Whitman, to broaden outreach to underserved communities. PYC@Whitman is a PYC choir that meets twice a week at a Whitman Elementary school in outer southeast Portland. This choir serves singers in third to fifth grade and is intentionally directed towards communities where it might be difficult to travel to Portland on a weekly basis. Started in the fall of 2017, Marysville Elementary, is the site of our second Neighborhood choir!